The Free one is with ads, you will not only see ads everywhere in the Spotify player, but also be interrupted when listening music. What's more, You can't download music for offline listening. How wasted the data traffic! On the contrary, Premium users can freely enjoy Spotify music without any ads and can download them for offline streaming. They can be served tunes at a higher audio quality. No matter whether you are a user of Free version or Premium version, all songs of Spotify are limited by DRM. You can’t stream Spotify music on all of your devices as you want, such as transfer to USB for playing in the car, or burn them to a CD for enjoying. 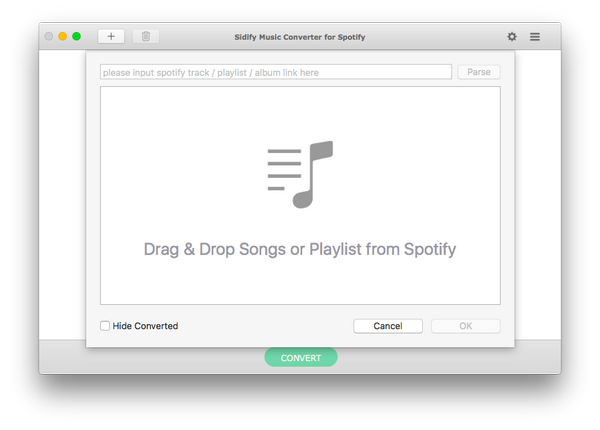 In order to enjoy Spotify music without restriction, we are going to need a powerful Spotify Music Converter which is a wonderful Spotify Music Downloader and speedy converter will assist you to losslessly convert Spotify music to DRM-free format, so that you can use Spotify music more efficiently. Launch the program and Spotify will be opened automatically. 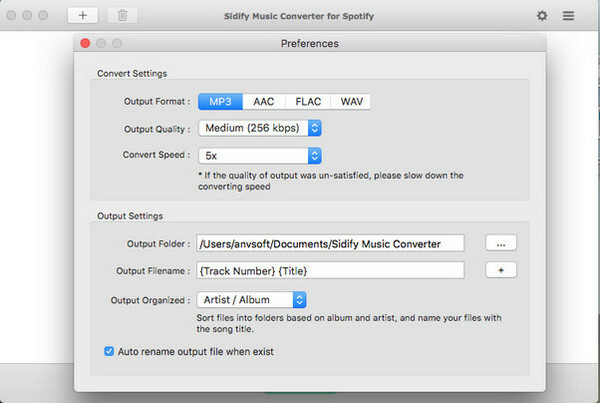 Just click " " icon and then drag and drop any music file or playlist from Spotify to Sidify Music converter. Check the music that you need to convert and then press "OK". Once added the music successfully, you can click setting button to change the basic parameters (Including Output format, Output quality and Conversion speed, etc). Here you can choose format as MP3/AAC/WAV/FLAC. Step 3. Start Downloading and Converting Spotify music to DRM-free format. Step 4. Find Out the Converted DRM-free Files. With our intuitive user interface, you can easily download and convert any Spotify music or playlist in just four steps while retainning 100% orginal quality and ID3 tags after conversion. Now, you can enjoy the Spotify music on all of your device offline, such as car players, iPod, iPhone, Zune, PSP and MP3 players, etc. 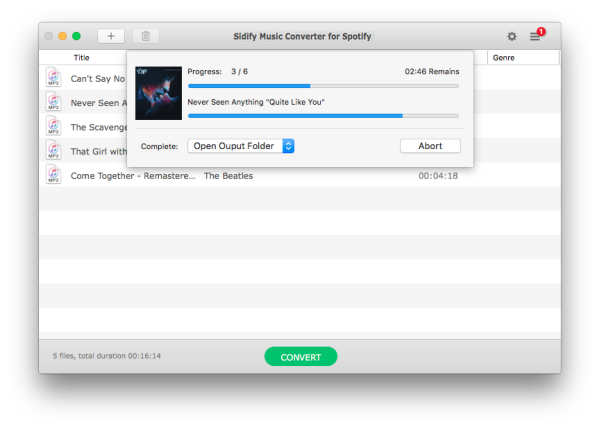 Note: The free trial version of Sidify music converter for Spotify enables us to convert 3-minute sample to evaluate the final outcome for each audio file, you can unlock the time limitation by purchasing the full version.